Though still something of a prisoner, Catelyn accompanies Robb to Harrenhal where they witness the slaughter Gregor Clegane left behind. Learning of her father’s passing, they travel to Riverrun for his funeral, where she reunited with her brother Edmure and her uncle Ser Brynden, the Blackfish. The outrage from the Freys at Robb’s marrying Talisa instead of the Frey woman he had promised is a serious issue, requiring negotiation with the Freys. Catelyn joins the rest in advising that Edmure wed a Frey girl instead, and Edmure grudgingly agrees. 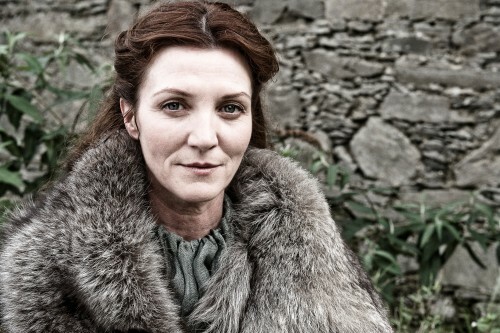 At the Twins, Catelyn is present when the Red Wedding begins, and is struck by crossbow bolts. Despite this, she crawls to safety… and then takes hostage Lord Frey’s young wife Joyeuse, threatening to kill her if he does not let Robb go. Lord Frey toys with the notion… and then allows Lord Bolton to kill Robb. She cuts Lady Frey’s throat, and is left silent and catatonic when the Freys cut her throat in turn.